The next breakthroughs in business intelligence and analytics will see machine learning and AI used to uncover previously hidden insights, suggest analyses, deliver predictive analytics and suggest actions. Tableau plans on embracing these trends in business analytics by introducing their natural language query feature, which is supposed to enable users to choose data sources and type conversational, natural language questions to generate new visualizations. 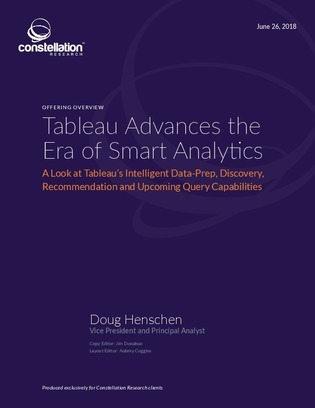 Read this report for more information on the features that Tableau is adding to their platform and how they are embracing the next breakthroughs in business intelligence.